Need School Security? Call in Steven Seagal! 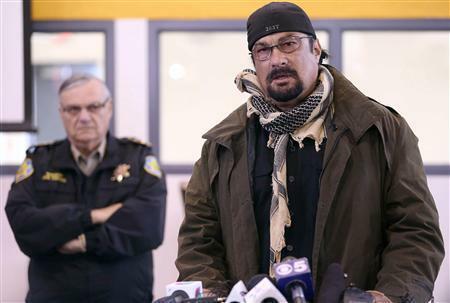 Action film star Steven Seagal, who racks up big body counts in his on-screen battles with bad guys, took on a new role on Saturday, training posse volunteers for controversial Arizona Sheriff Joe Arpaio in how to use guns to protect schools in shooting incidents. Arpaio, who styles himself as “America’s Toughest Sheriff,” enlisted Seagal to train his Maricopa County posse members at a school in Fountain Hills, a suburb northeast of Phoenix, with children used as stand-ins for scared students. Seagal, a burly martial arts expert turned actor, guided 48 volunteers through various aspects of responding to a shooting, including room-to-room searches, and critiqued their work. “I am here to try to teach the posse firearms and martial arts to try to help them learn how to respond quicker and help protect our children,” Seagal said. Arpaio, whose tough stances on crime and illegal immigration have made him a national figure, has dispatched the volunteer posse to patrol schools in response to the shooting rampage that killed 20 children and six adults at a Connecticut school in December. Those killings touched off a renewed debate over gun violence in the United States. President Barack Obama proposed a sweeping package of gun-control measures, including a ban on assault weapons. The National Rifle Association, which opposes the gun-control proposal, has advocated placing armed security guards in schools. Arpaio’s volunteers, some trained and qualified to carry the same guns as deputies, can intervene if there is an imminent threat to life. To add realism to the training event, guns firing non-lethal rounds that leave a color mark were used. “It’s important to help protect our children and our schools and we need to do that with whatever means we have,” said Rick Velotta, a posse member and retired General Electric manager who attended the training. About a dozen people protested the event. “No gun should ever be in a school,” said protester Cynthia Wharton, a Fountain Hills resident. Arpaio’s 3,450-strong posse of unpaid men and women has for years helped the sheriff target drunken drivers and illegal immigrants, and chase down fathers who are behind on child support. Last year, Arpaio sent posse members to Hawaii to investigate the authenticity of Obama’s birth certificate at the request of local Tea Party activists, a key Arpaio constituency. Seagal also has been sworn in as a sheriff’s deputy in a Texas county along the border with Mexico and appeared in a reality TV show detailing his work as a reserve deputy in New Orleans. Instead of training school security posses, it would be nice to see a school trying to change its culture, become more inclusive and make its student population feel appreciated for who they are and what they have to offer.